Uluwatu Sunset Tour with Kecak Dance, it is a private half day trip in Bali to visit Uluwatu Temple and also to watch the Kecak dance & fire dance performance while viewing a beautiful sunset in Uluwatu Bali. Uluwatu Temple Tour is one of the best Bali half day tours for those who want to explore the South of Bali and experience an amazing sundown from a point that is located on the cliff facing to the Indian Ocean which is a perfect spot to watch the sunset in Bali island. 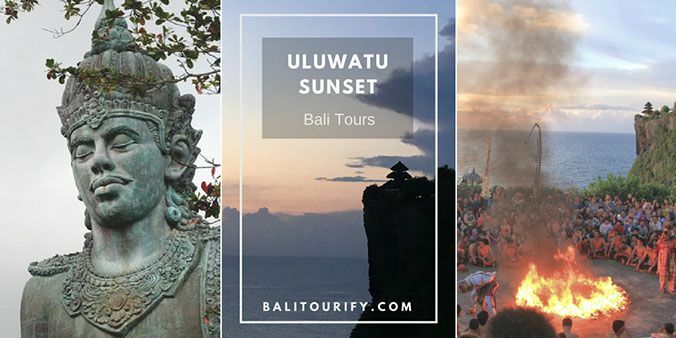 We are from Balitourify offer you the private Uluwatu Temple tour with Kecak dance and Bali driver hire for half a day (5 hours to 6 hours) to discover the nice places around Uluwatu Bali. Below is the Bali Uluwatu Tour Itinerary in a half day to explore Uluwatu Temple and also to enjoy the spectacular Balinese Kecak & Fire dance performance with beautiful sundown in the background. Please noted that the Uluwatu sunset tour itinerary is flexible and adjustable, you can easily change the itinerary but stay in accordance with the time that has been provided. 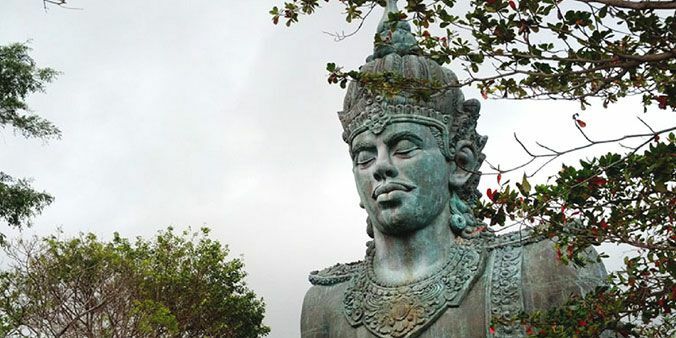 The first place to visit in the half-day Uluwatu tour itinerary is Garuda Wisnu Kencana Cultural Park (GWK). GWK is an approximately 60 ha field of a cultural park which is located in Bukit Ungasan, South of Kuta, Badung Regency, Bali, approximately 11 KM or 20 minutes drive from Uluwatu Temple. GWK Cultural Park features a superb Indonesian historical heritage for long periods to feature the new monumental Garuda Wisnu Kencana Statue as the Indonesian symbol of culture, the primary artistic masterpiece on the island of Bali. It is designed by I Nyoman Nuarta, a reputable Indonesian sculptor born in Bali island. Garuda Wisnu Kencana statue is the icon of The Lord Vishnu ride-on the huge Garuda (the king of birds) as his trustworthy partner. The statue is made to be one of the world’s biggest and highest monumental statue. The overall height of the statue is 120m, includes 24 parts and constructed with 754 components made from copper and brass covered patina resistant. The second destination to go is Uluwatu Temple (in Balinese: Pura Luhur Uluwatu) that is situated in Bukit Peninsula in Pecatu, South of Kuta, Badung Regency, Bali, Indonesia. Uluwatu Temple is built at the edge (in Balinese: ulu) of a 70-meter huge cliff or rock (in Balinese: watu) jutted into the sea facing to the Indian Ocean which makes it a perfect place to see the sunset in Bali island. This sea temple is considered to be one of Sad Kahyangan Temples (Bali's 6 primary temples) which is devoted to God in his manifestation as The Lord Rudra who controlling the Southwest direction of the world. Although a smaller temple was stated to have persisted earlier, the design was considerably applied by a Javanese holy monk, Mpu Kuturan in the 11th Century. Another holy priest from East Java, Dang Hyang Nirartha is attributed for building the Padmasana shrines which is said that he accomplished Moksha in this place. The next thing to do in Uluwatu sunset tour schedule is to watch the Kecak & Fire Dance performance which is located close to Uluwatu Temple. The Fire & Kecak Dance show is set on the open stage and it starts just before sunset time or in several minutes before 6:00 PM of Bali time. Kecak dance (in Indonesian: Tari Kecak) is a form of Balinese dance & music drama which was established in the 1930s. Since its development, it is often performed mainly by adult men, the beginning women's Kecak grouping commencing in 2006. The story in the Kecak Dance is implemented from the ancient Hindu epic Ramayana, an epic from ancient India which narrates the struggle of the blissful prince Rama to save his wife Sita from the demon king Ravana. The rescue was led by Prince Rama (Shita's husband), Prince Laksmana, Hanuman, and the monkey army. Kecak dance is also identified as the Ramayana Monkey Chant, played by a circular group of around a hundred performers dressed in a checked black & white cloth around their waists, each other chanted "chak" and moving their hands, fingers, and arms, demonstrates a war from the Ramayana. Trance ritual is commonly provided in the Kecak dance throughout particular stages. Such as within the act of the burning of Hanuman that is followed by the fire kicking often called the Fire dance is associated with a trance state by the dancer of Hanuman in which he is blessed by the priest before the action. During the phase of trance, the dancers do not experience any suffering from the flames. 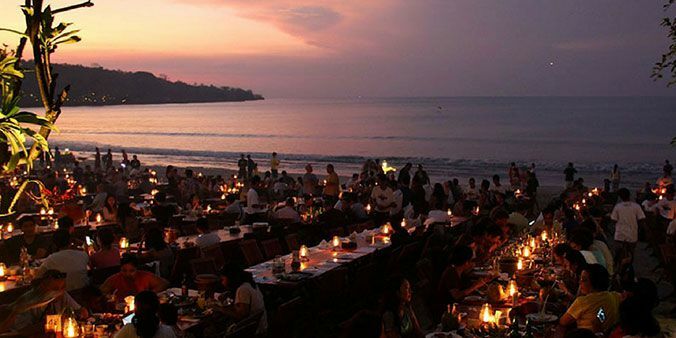 The last place to visit in the half-day Uluwatu tour itinerary is Jimbaran Beach for having seafood dinner. This is optional, it means we can take you to Jimbaran Bay for having dinner if you wish to or we can go back to your hotel. Jimbaran Bay Seafood cafe lies along Jimbaran Bay coast, it is a group of the restaurants (around 30 cafes) in Jimbaran Beach Kuta, Bali, it is also often called as Kedonganan Beach, the dinner is set up in the open air perfectly on the sandy beach right in the front line of the ripples of the waves while enjoying the lovely romantic evening. The restaurant offers seafood with many kinds of fresh fish to choose such as Snapper, Lobster, Sea Prawn, Crab, Squid/ Calamari, Fish & Chips, etc. The inclusions and exclusions of The Half Day Bali Sunset Uluwatu Temple Tour with Kecak Dance. General information of the entrance fees and the opening hours of the attractions on the itinerary of The Half Day Bali Temple Uluwatu Sunset Tour with Kecak Dance. The Pick-up time and location of The Half Day Bali Sunset Uluwatu Temple Tour with Kecak Dance. Below are the common things to bring on The Half Day Bali Temple Uluwatu Sunset Tour with Kecak Dance. We accept cash payment for The Half Day Bali Sunset Uluwatu Temple Tour with Kecak Dance. You can pay directly to our driver on the same day of the tour. You are free to cancel the booking of The Half Day Bali Temple Uluwatu Sunset Tour with Kecak Dance. You must inform us in one day before the tour (24 hours earlier) for the cancellation. 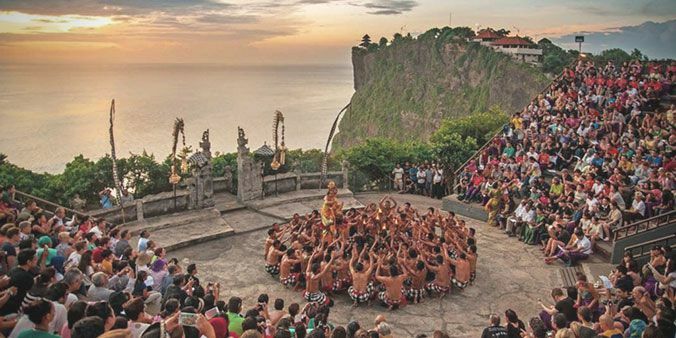 Below are the commonly asked questions regarding the Half-day Uluwatu Temple Tour | Bali Uluwatu Sunset Tour with Kecak Fire Dance. Please contact us if you have any questions regarding this trip. 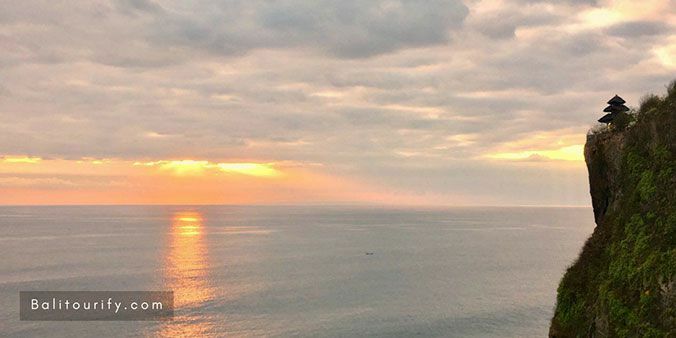 What's included in the half-day Uluwatu Sunset Tour? What is NOT included in the private half day Uluwatu Temple Tour? It does NOT include dinner, entrance fees for visiting tourist attractions, entrance tickets for watching the Kecak dance performance. Is the price listed in The Uluwatu Sunset Tour for per person or per vehicle? The price listed in the half-day Uluwatu Temple Sunset Tour is per vehicle (NOT per person), our vehicle capacity is maximum of 6 persons. If you book the half day Uluwatu Temple Sunset Tour for 1 person or maybe 6 persons then the price would be the same (IDR 400,000). What to bring on the Bali Uluwatu Tour? You can wear a simple casual outfit, bring a bottle of mineral water with you to stay away from dehydration (the island of Bali offers high humidity), sun-screen to protect against skin burns (Bali is hot), cash money (for lunch/dinner, entrance tickets or shopping), sunglasses, smartphone/camera, medicine (if in treatment). How much is the entrance fee to visit Uluwatu Temple? The Uluwatu Bali entrance fee is IDR 30,000 /person and IDR 15,000 for children (valid for 2018 - 2019, the entrance fee may change without any prior notice). How much is the ticket price to watch the Fire & Kecak Dance performance? The ticket price of the Kecak & Fire Dance show is IDR 100,000 /person and IDR 50,000 for children under 10 years old (valid for 2018 - 2019, the entrance fee may change without any prior notice). We have to be in the location at least at 5:00 PM because usually the Kecak Dance tickets will be sold out in several minutes after 5:00 PM. How much is the entrance fee to visit Garuda Wisnu Kencana Cultural Park? What is the dress code to enter the area of Uluwatu Temple? Uluwatu Temple is a sacred place for Balinese, all the visitors and tourists are required to wear a sarong and sash to maintain the sanctity of the temple area. The sarong and sash are free to use (it's included in the entrance fee). What's the opening hours of Uluwatu Temple? The opening hour is normally from 8:00 AM to 7:00 PM (after the Kecak dance) every day. I have been told that the monkeys in Uluwatu Temple are cheeky, stealing tourist's belongings, is it real? The monkeys in Uluwatu temple live in the wild, they're always looking for food around the temple's location. All visitors are advised to keep on their belongings safe such as the sunglasses, glasses, hat, cellphones, camera, handbag, etc, so as not to be taken away by monkeys. Additionally, it is recommended to not carry snacks. What time is the sunset in Uluwatu Temple Bali? Will the driver wait for me if I want to have a seafood dinner in Jimbaran Bay? Yes, for sure. We will pick you up in your hotel for this Uluwatu day trip and we will take you back to your hotel after finish the trip unless you want to drop somewhere on the way back to the hotel by your own request. How much the cost of having seafood dinner in Jimbaran Bay? There are many menu packages that you can choose according to your budget, make sure to take a look at the tax and service before you order a food. How do I book for the half day Uluwatu Tour? You can easily fill your details in the Book Now tab below to book this Half-day Uluwatu sunset tour. You can also send us an email or at this page to book this tour, all tours that are available on our website have the ID, make sure to mention the ID when you book a day trip from us (The ID for Uluwatu Sunset Tour is UST-02). How do I pay for the Uluwatu Tour? We accept cash at the moment, you can pay directly to our driver who comes along with you on this Uluwatu trip. How do I cancel the booking of this Half Day Uluwatu Temple Bali Sunset Tour & Kecak Fire Dance? You are free to cancel the booking of this Half Day Uluwatu Temple Bali Sunset Tour & Kecak Fire Dance with no cost, but you must notify us about the cancellation at least one day in advance by sending us an email or calling to our contact number.